On my post Friday Funny: Bryant Siblings Having Some Fun, I left off with the question, "Who was Annie Marie Bryant Barnes?" Previously when I talked about the Bryant siblings in my family, I only referred to 7 siblings. My maternal great grandparents Frank and Ophelia Bryant's children from oldest to youngest were Frank Jr., Linwood, Loris, Ray, Mary, Rosa and Eloise. Well, it turns out that my great grandfather Frank had an eye for the ladies and "Yadayadayada" Annie Marie Bryant was born. You're probably saying, "What?! What the heck, you yadayadahed the best part!" In case you don't get this reference please refer to the following Seinfeld clip. I guess I should try and explain a bit. Frank Bryant had an affair with a woman by the name of Carreta Bell. She was born January 14, 1900 in Morehead City to James and Annie Bell. The Bell family lived in the same neighborhood as my great grandparents. 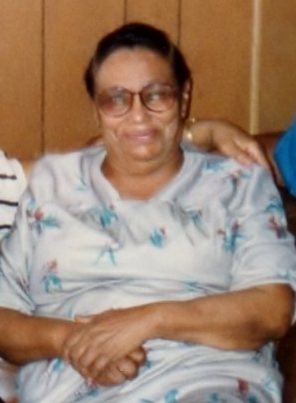 Caretta never married but she had at least 3 children, one of which was fathered by my great grandfather. Here's the 1910 census for Morehead City. Caretta's shown living with her widowed mother Annie and brother Andrew. If you look a little further down on the page, guess who you see? That's right, Frank Bryant's family. In 1920, Caretta Bell was shown living with her mother who had remarried and her step-father Anthony Dudley. Source Citation: Year: 1920; Census Place: Morehead, Carteret, North Carolina; Roll: T625_1284; Page: 10A; Enumeration District: 3; Image: 866. Source Information: Ancestry.com. 1920 United States Federal Census [database on-line]. Provo, UT, USA: Ancestry.com Operations Inc, 2010. Images reproduced by FamilySearch. Fast forward to 1925, and my great grandfather Frank welcomes not one but two children into the world that year. Annie Marie Bryant was born on April 1st. Rosa Nezabeth Bryant's birth followed on September 17th. Of course this situation poses all sorts of questions in my head. Did my great grandmother know about this other child? If she did, how did she find out? What about my grandmother and her siblings? When did they find out about this? 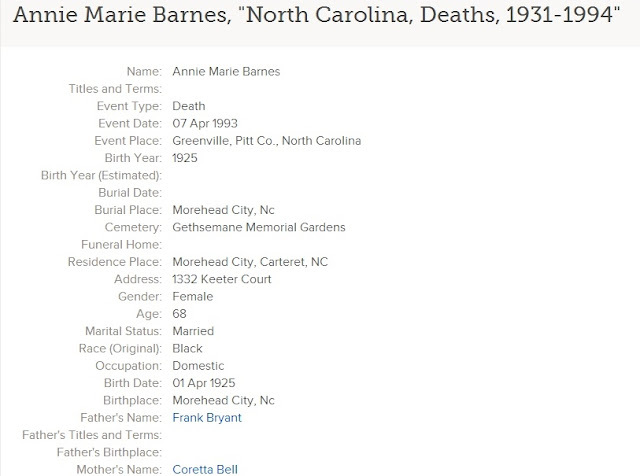 I didn't find out about Annie Marie Bryant Barnes until I read about it on my aunt Rosa's funeral program. It's funny sometimes how when you go ask people about something they react kind of like, "Oh I thought you knew." When I asked my mother about it, she said she didn't know about Annie until she met her while visiting Morehead City one year. That's when she remembered the picture I featured in yesterday's post. Here's a closeup of Annie. Now I know this picture was taken earlier than I previously thought because Annie died April 7, 1993. 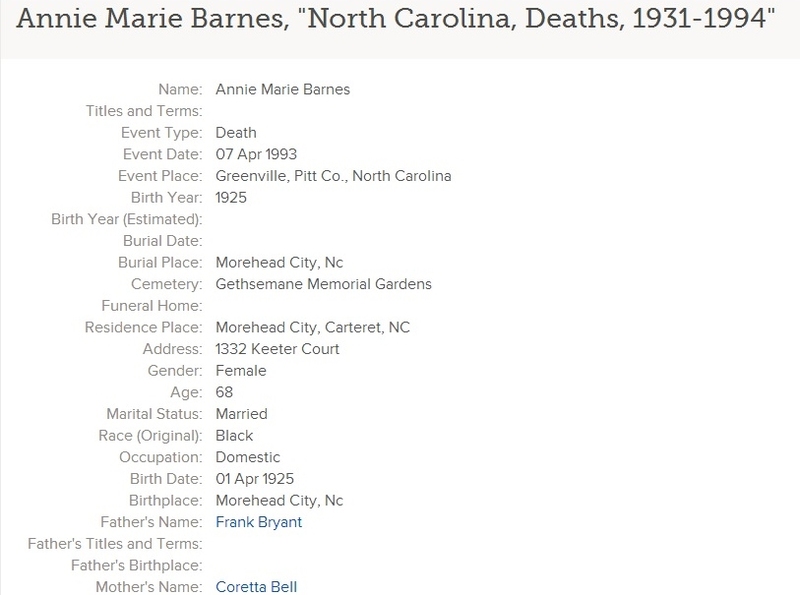 (https://familysearch.org/pal:/MM9.1.1/FGX1-WJN : accessed 05 May 2013), Annie Marie Barnes, 07 Apr 1993. So there are actually 8 siblings, as I think you indicated in your last post. Annie Marie Bryant looks happy and comfortable in the picture, and good for her. And for your great grandfather -- two children in one year. Yadayadayada. I wonder if that's in the dictionary by now? It should be. I know exactly what you mean about the "Oh, I thought you knew" reaction from relatives. 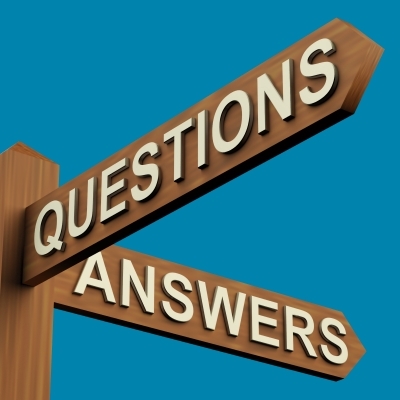 I've come across many items that were an "open secret" in the family . . . but apparently not open to me! She looks so Happy and Content! I wish I had the chance to speak with her. So many unanswered questions. She does look content in this picture.